Lets start with the Dragoon. This guy was pretty fun to work on, it's the first vehicle I've done for 40k. I learned a lot while working on him. The main thing I learned was, paint vechiles in sections. Because holy Hell, some spots were hard to reach and there wasn't really a good way to hold the model without touching it. After painting the top section, I realized he needed to be on his base, so I knocked that out and painted his feet. 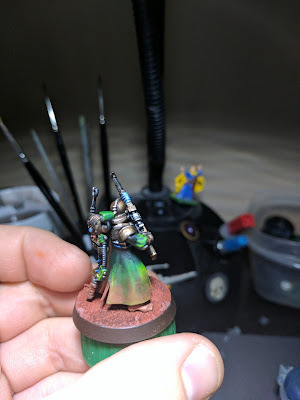 After he was glued on to the base, it made painting a bit easier. But once I get past the 2nd one I have assembled, the last 4 will be painted in pieces. He still needs some weathering, but now that I have my Secret Weapon pigments on hand, that'll be a cake walk. I'm not going to chip his paint, just make him look dusty. 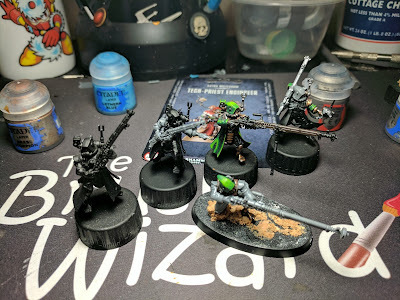 The Skitarii Vanguard have been finished for awhile, but I wanted to weather their coats a bit and make it look like the dirt from the surface was collecting on their coats. Originally, I tried a mix of rubbing alcohol and pigment, but the effect wasn't what I was looking for. I also had an issue with some of the pigment turning white on the model, which meant I needed to spend extra time cleaning it off and trying to fix it. I have them all fixed now, but one guy who's not playing nicely. I'll have to fix him tonight, before I get to work on other things. It does feel nice having a full unit finished though. It's like I have an actual army starting! My first HQ choice for my Skitarii is a Tech-Priest Enginseer. I've always liked the look of this guy, and was bummed when they originally released him as part of a box set with an Imperial Guard tank. But he's available loose now, so I snagged one up. I've had to paint him in sections though, because of how he goes together. I've really enjoyed working on him and he's getting a little more attention to him, since he's a character/HQ model. He's almost finished, I just need to paint his servo-harness and get that attached to his back. From there, its just a matter of dullcoting and weathering him. Exciting times for sure! 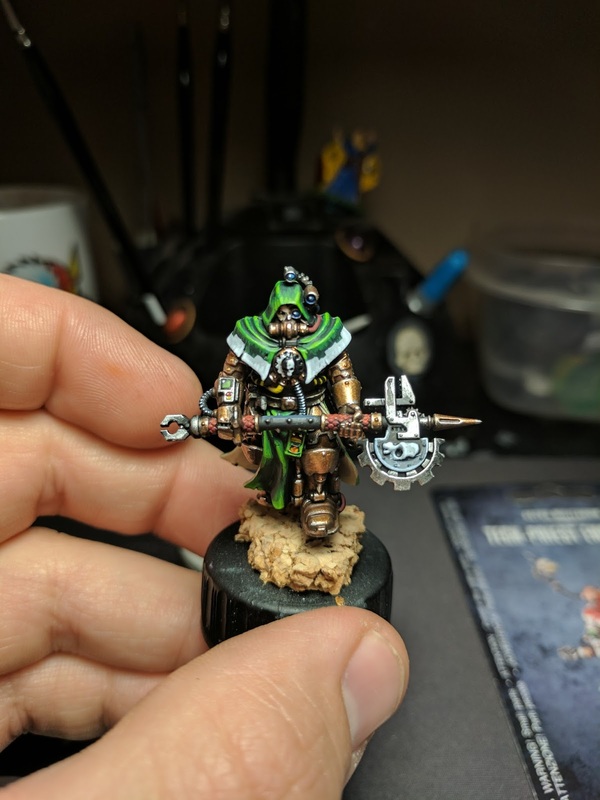 For my army, I decided I wanted to take my 2 HQ units as Enginseers. But I didn't want to use the same model for both. 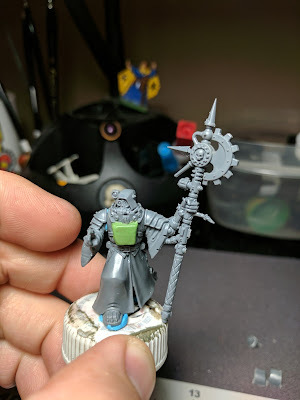 Thanks to some bits from the Tech Priest Dominus kit, I was able to make that happen. For this guy, I used the body from the Datasmith from the Kastelean Robots kit, a head from the Skitarii Rangers kit and the arms from the Dominus kit. I'm also going to attempt to custom sculpt the details on his chest, which should be fun. I'm not a fan of his pinky finger sticking out though, so that'll also get cut off and a new one sculpted. Also, I need to modify his right arm. I'll be cutting off the arm at the elbow and straightening it out a bit, then cutting off the forearm and replacing it with a mechanical one, possibly from the Ruststalker kit and adding a hand with a laspistol to it (which Joe from Broken Paintbrush was kind enough to donate. I still need to come up with a servo arm and backpack for him. But, he's coming along nicely. I think he will be my "warlord" for the army. Finally, I was able to salvage my 5 man unit of Skitarii Rangers. Originally, I had built my box of Rangers into 2 5 man units. One with sniper rifles and one with arc rifles. After screwing up my sniper unit, I decided to go all Vanguards and a 5 man unit of Rangers with sniper Rifles. 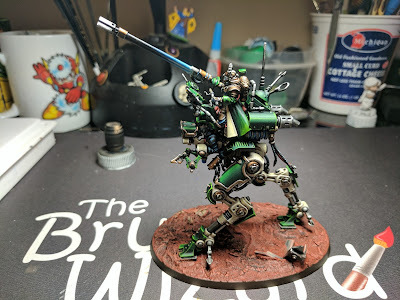 I decided to keep my crouching sniper, which was converted using T'au Pathfinder legs. I replaced his damaged rifle with a new one out of a kit of Skitarii that I'll be using for Vanguards. I wanted the rest of the unit to look like they are camping out. So, I robbed bodies from the unit of 5 that I had intact and grabbed 3 that fit the bill. I wanted the alpha to be pointing. But since I'm running an Omnispex in the unit, I needed the arm that is resting his rifle on the shoulder for that one. 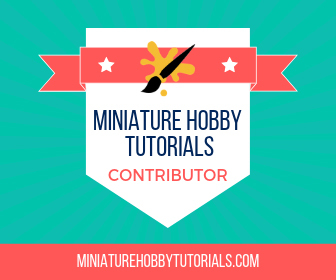 Luckily, I found that the Vanguard/Ranger kit comes with plain rifles that I can use for converting! So I grabbed the galvanic rifle from it and chopped up a ranger arm and the rifle to make it look like the Vanguard Alpha was holding it. It turned out pretty well and now I'm getting ideas on what to use the Vanguard's loose radium carbine for. Anyway, that's it for now. You can see more progress as it happens by following me on Twitter and Instagram. Great. That green looks very nice.